Staying outdoors is well catered to with Coastal and Outback Camping Grounds and Bush Camps along the coast to rejuvenate and relax. Whyalla combines coastal tranquillity, rare sea life events and vivid landscapes that enrich, enthral and rejuvenate. Whyalla provides enduring memories for visitors to the region delighting many with the surprising natural attributes and experiences on offer. 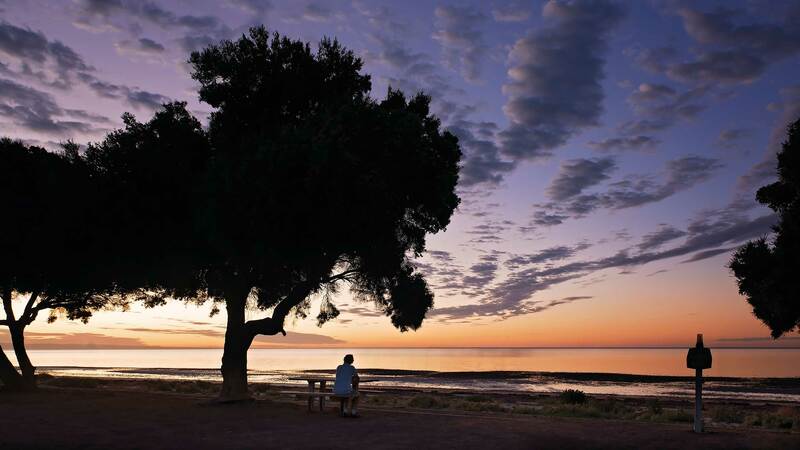 Enjoy the outdoors in one of the many Whyalla beaches, parks and gardens. The semi-arid conditions and Whyalla’s position on the coast of the Spencer Gulf provides for spectacular sunsets, diversity in landscapes and over 300 days of sunshine per year. Native wild-life, birds and sea-life including Dolphins and Giant Cuttlefish antics unique to Whyalla will enthral. Numerous walks and trails will showcase the beautiful landscapes. The diversity of outdoor activities allows for young and old to unearth experiences with safe sandy beaches, bush and coastal trails and parks both on land and in the ocean. Fitzgerald Bay - 32 km north-east of Whyalla. Sixteen kilometres along the Point Lowly / Port Bonython Road is the turn-off to Fitzgerald Bay. Free bush camping is available for a maximum stay of 14 days in three designated areas. The roads are unsealed. Contact us for more information.